What is the Boxcar Seawall? 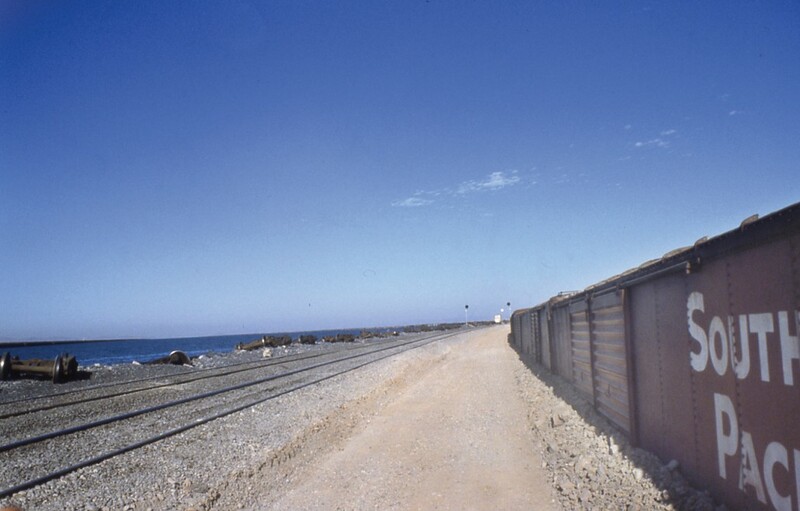 Boxcar seawall from the “seaward” side, September 1983, with berm on far left. Great Salt Lake is split into a north arm and south arm by a railroad causeway. The two arms have differing color, chemistry, biology, and lake surface elevation (see article by J.W. Gwynn in Survey Notes, 2002, v. 34, no. 1, p. 1). The history of this disunion begins with a railroad shortcut, followed by periodic construction projects necessitated by the dynamic character of Great Salt Lake. A feature associated with the railroad causeway, known as the boxcar seawall, is an intriguing piece of this story. An outstanding feat of American railroad engineering is the 102-mile-long Southern Pacific Railroad Lucin Cutoff stretching from Ogden to Lucin, Utah. It bypassed the circuitous 1869 Promontory Summit route, where the Golden Spike was hammered, by going straight across Great Salt Lake. The Lucin Cutoff took just over two years to construct and was fully operational by 1904. The segment crossing the open waters of Great Salt Lake was the most challenging, including more than 8 miles across Bear River Bay and more than 20 miles from the Saline railroad siding to the Lakeside settlement. The original Lucin Cutoff included three rock embankments constructed in the lake: the Bagley Fill across Bear River Bay, the Rambo Fill on the westernmost side at Lakeside, and the Saline Fill at the southern end of the Promontory Mountains, all totaling nearly 15 miles. The 12 miles between the Rambo and Saline Fills was spanned with the longest wooden trestle bridge in the world, now dismantled and reclaimed. Fifty years after construction, the deteriorating trestle required extensive upkeep and an expensive overhaul loomed. Because rail traffic could not be disrupted, the idea of restoration was abandoned in favor of sidestepping the trestle with a solid-fill causeway to be placed 1500 feet north of and parallel to the trestle, connecting the Rambo and Saline Fills. The causeway took three years to build and was completed in 1959. The amount of material handled was nearly a third of that excavated for the Panama Canal. A year after completion, the causeway had sunk about a foot into the soft sediments of the lakebed, and nine years later had sunk 3 more feet. It continued sinking a few inches each year thereafter. The diminishing freeboard, or distance between the lake level and the top of the causeway, was not an immediate concern because the lake level remained low, at least for the first two decades after construction. Then, from October 1981 to April 1987, the lake rose more than 13 feet, to nearly 4212 feet above sea level, a high not seen in more than a century. 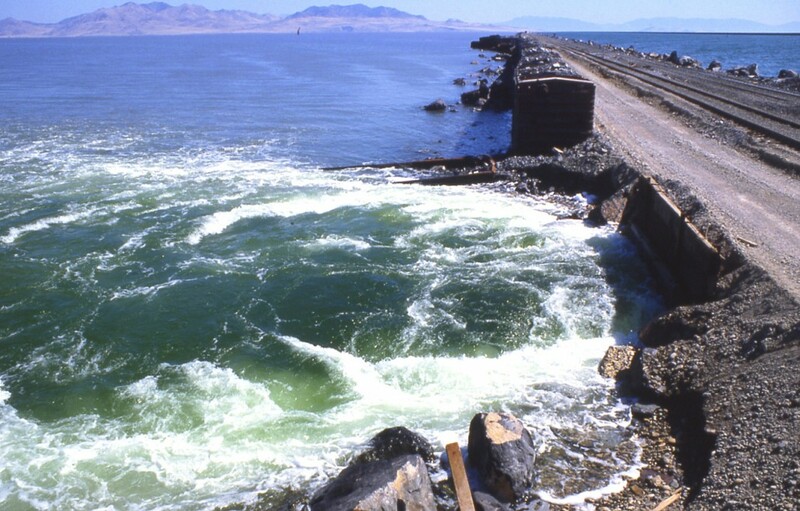 Storms over Great Salt Lake can generate waves greater than 8 feet in height, and due to the high salinity of the water, the waves are denser and have higher energy than ocean waves. Storms can also produce a storm surge on the lake, pushing the water against the shore or causeway and, in effect, raise the lake level 1 or 2 feet. By 1983, waves began to overtop the causeway, scouring and eroding the protective riprap. 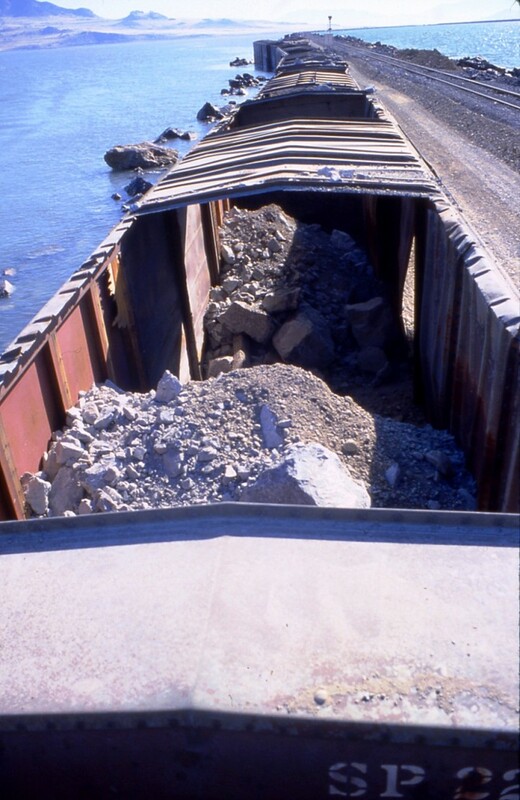 A prompt solution was required, so it was decided that the best initial step to maintaining the causeway was a “boxcar seawall” to act as a breakwater. The seawall was intended to defend the north side of the causeway, which bears the most intense impact from storm waves. 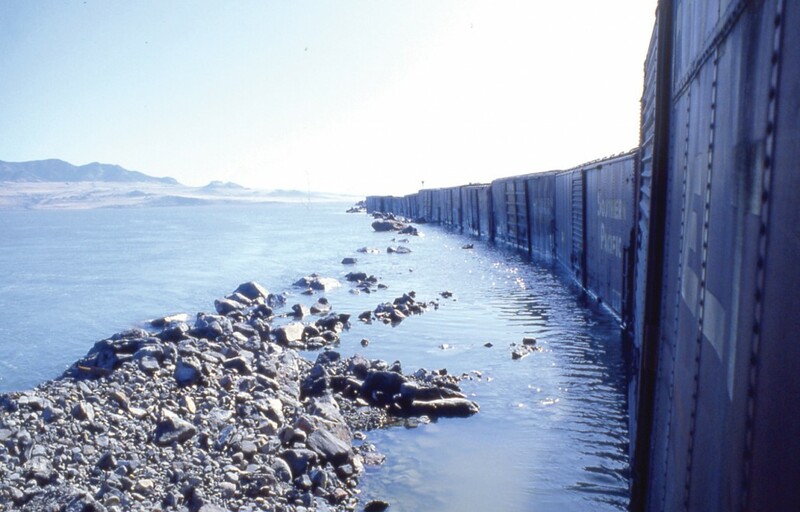 In August and September of 1983, the Southern Pacific Company placed 1430 surplus boxcars, hopper cars, and gondolas (low-sided, open-topped cars) along the edge of the embankment, creating a barrier between the causeway and lake. The wheel and axle assemblies were removed from the cars, and the ends of the roofs were cut out leaving only a center strip in the middle third. The cars were placed end-to-end in a shallow ditch between the causeway and a small berm and then filled with quarried rock. Raising the elevation of the entire causeway began the same year the seawall was built and continued until 1987, requiring millions of tons of stone. Crushed limestone was used to raise the causeway more than flush with the top of the boxcars, as much as 10 feet in places. The remainder of the seawall was concealed with boulders weighing one ton or more, dubbed “armor stone,” to shield the causeway from erosion. 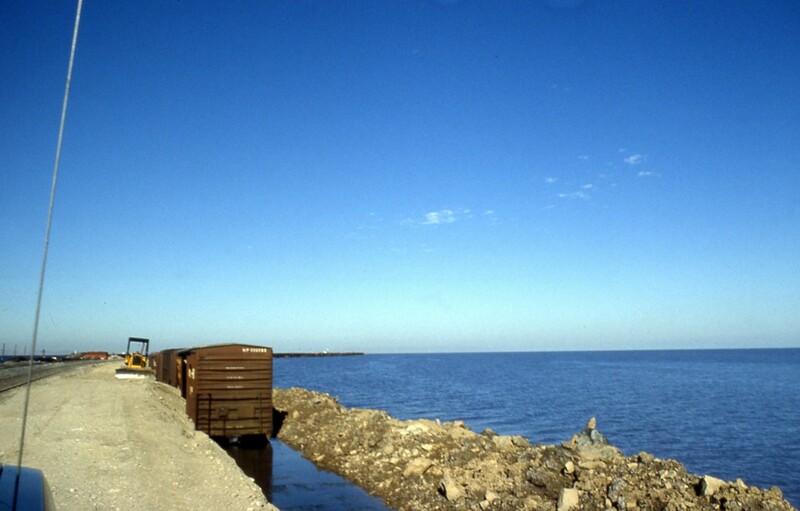 The boxcar seawall provided crucial protection during the time needed to raise the causeway, sheltering it for years and easing disruptions to train traffic, even as the lake continued its rapid rise. The seawall signifies yet another large-scale engineering success in the challenging and enduring history of the path across Great Salt Lake. Survey Notes, v. 47 no. 1, January 2015.